Take a guided historical tour led by Bridget Oates, the author of Sam’s Castle! The 1.5 hour event includes light refreshments. 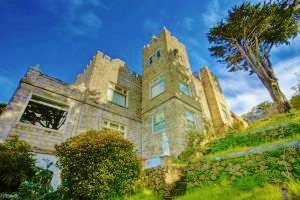 After your tour, you will have time to take in the view, snap photos, and enjoy the whimsical ambiance of Sam’s Castle. Be sure to bring your camera! Tickets are limited, so please reserve early. These events are for adults only and we ask that women refrain from wearing spike heels to preserve the beautiful floors.